No matter how poised and neat you were before, a pregnant woman will find she will get some food particles, wet and dry on her clothes. Many times she won’t notice it until someone points it out to her. I think it’s a way of nature preparing you for the messes ahead, the multiple changes a baby will go through even before she learns to lift her head and most importantly to teach you vanity has no room in a new mommy’s qualities. The things the non-mom you made fun of or swear you’d never do will suddenly become necessary or second nature to you. Whether it’s putting speakers on your growing belly, using your belly as a shelf or using pregnancy as an excuse “I’m pregnant. I’m going to be irrational.”, you will find yourself doing it and doing it proudly or matter-of-factly. You will suddenly feel like stuff ‘on sale’ is subpar for your baby to be. I know it’s in my head but I look at baby stuff on sale with a questioning eye. You will proudly proclaim you’ve passed gas to close friends and family. You will occasionally cry for no reason at all in a public place. You will occasionally smile as if you know a secret no one knows in a public place. You will love your husband when he comes home with the pillow you made fun of 2 months earlier for being expensive and a waste of money. My husband bought the best Valentine’s Day present ever. 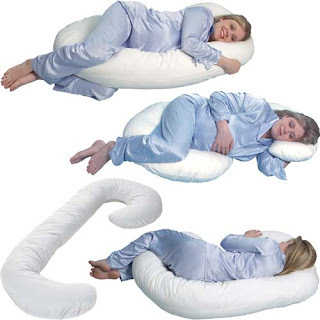 The Snoogle is the best thing since sliced bread. I’ve hit the point where it takes at least 15 minutes of rearranging pillows around me to get comfortable in bed. The dogs that normally circle at least 5 times to get their bed pillow comfy are looking at me strangely now. My poor husband has to live with foot cuddling for fear of ruining my pillow mass. He gave me the Snoogle at 6pm and I’ve only parted with it to cook dinner. Whoever invented this bad boy is my new best friend. Gentlemen, if your lady is pregnant, buy this for her, even if she makes fun of it like I did. At 12 weeks I teased that I would not spend good money for something I can do with existing pillows. You cannot get the pleasure and comfort the Snoogle has given me in the last hour and half. Yes, I love this thing that much. An hour and half and I’m like Britney Spears, ready to run to the nearest Las Vegas chapel and marry this sucker. Yes, pregnant women get hunger cravings but they can also go through spurts where nothing seems appetizing and they need to remind themselves to eat something. The body is remarkable. Inside my tiny body another being is growing and my body is elastic and making room for baby. Every day I walk out of the shower and look at my body I’m amazed. Not to sound sappy but this is what being a woman is about. It’s not about me anymore.